Following on from Monday's Domestic Violence Awareness Month post, today's card has been inspired by another cause that's so close to my heart, Breast Cancer Awareness. While my experience is again first hand, thankfully my lump proved to be a harmless, if large, cyst, that I still have to this day. The terror that I felt when I found it while soaking in the tub will always remain with me. The week long wait for the hospital appointment was and will remain, the longest, perhaps scariest week of my life. That might surprise you a little, given what I shared on Monday, but it's partly because of the timing of the scare that I consider it to be the scariest. For the first time in my life, having escaped the abuse a few years earlier, I felt in control of my life. The lump, the uncertainty, sort to shatter that. The doctor I saw at my GP's office the morning after finding the lump, was also pretty certain that it was cancerous. So what did I do? I did the only thing I knew by then to do. I faced my possible cancer head on and started fighting it immediately, at least mentally. I had to. I had to prepare myself for the worst and be strong for those around me, who I was more concerned about than I was for myself. Thankfully as I've said, scans showed the mass to be a harmless cyst, that I still have. I can't describe how I felt upon that news. I was obviously relieved, but more than that, my thoughts were again for my loved ones. We'd faced it and gotten through it together. There are certain times of the month when I feel the cyst more than others, and yes, in the back of my mind is the possibility that it might turn nasty at some point. If it ever does, I'll be ready for the battle, just as I was soon after I found it. The sentiment on the card is perfect for someone who has been so supportive of me and indeed the card is winging its way to her right now. If you've been touched by my post and would like to speak to me, in absolute confidence, about the issues raised, please do. I'm here for all of you, whether you're a regular reader, or this is the first time you've read one of my posts. You can reach me either via the Ministry page, or by email to emlouisef at gmail dot com. 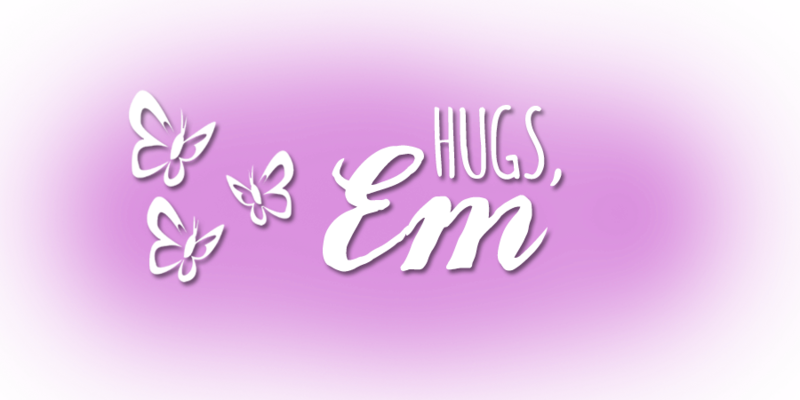 I'll be back on Friday with another Awareness Month creation, and I'll again share some more of myself with you, my beloved readers and friends, so I hope you'll join me then. Labels: Awareness Month, Bird Builder, Boho Chic, Deco Labels Framelits, Me = Grateful, Stampin' Up! I'm glad your lump was a harmless cyst. I know first hand what it's like to find a lump and the long wait but I survived the breast cancer and it has made me stronger. I now make my cards to sell to raise funds for breast cancer charities and am a big promoter of awareness. 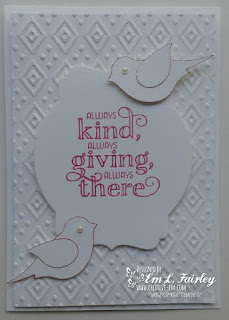 This card is really beautiful, it's a really lovely sentiment and the birds are so sweet. Thank you for sharing your experience, I'm sure it will help a lot of people to know that not every case is breast cancer but its always best to get it checked. Em, I went down this same road with my oldest daughter when she was in high school and ten years later. Cancer is a common factor in my family (so many diagnosis, so many deaths, and so many survivors). So I know what you have gone through. Anyway, you have produced a beautiful card. 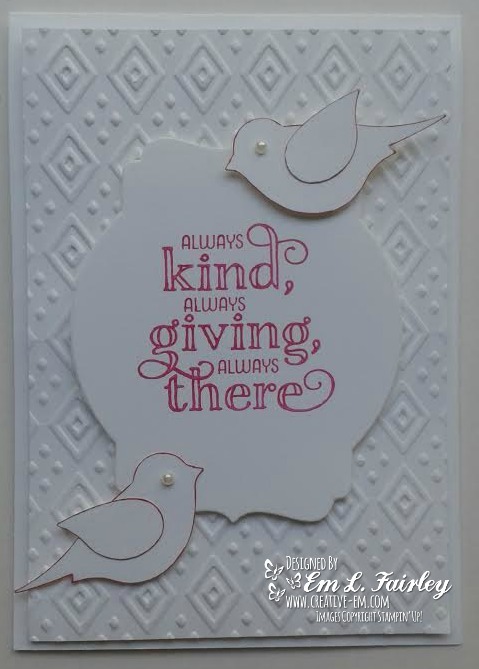 thank you for entering Pixie's Snippets playground again with another beautiful card. Sending a card is a lovely way to tell people that we are grateful of their support. It is indeed a very frightening time when you discover a lump. A few years ago, one came up during a routine check up. It was so deep that the doctors advised that it would be better to take it out instead of doing the biopsy. It was still very small at the time. I remember waiting for the surgery and then for the results - very scary. It turned out to be just a cyst but every year I still cringe when it comes to check up time. Your card is beautiful Em. The birds are very sweet. This is actually a very sweet and hopeful card. Thank you so much for taking time to post your very creative art with us this week at Word Art Wednesday in our 205th AG challenge! A beautiful card and I too experience finding a lump but was very lucky in that it was a cyst. I agree with you that when you find a lump the fear is so really and will stay with me forever. Thank you for sharing. What a sweet card, Em. I am always SO BLESSED to have you share your creativity with us. It means SO much to me, and I can't even tell you how very grateful I am for you. Thanks for playing along, and may God bless you this week and always. I love stopping by! Lovely card, Em! Just want to share a Scripture verse with you. Isaiah 26:3 "You will keep him in perfect peace, whose mind is stayed on You, because he trusts in You." When those thoughts of doubts come, keep your eyes and mind on Jesus and He will give you a peace that passes understanding. God bless! Thanks for sharing with us at Word Art Wednesday!! Great card! Love the white and the darling birds! Thank you for playing along in the Word Art Wednesday Challenge! Have a blessed day!